While we often feel gross when we’re sweaty, it’s much more of a blessing than a lot of people realize. Humans’ ability to sweat is a massive boon to our survivability in hot environments, as it allows the body to naturally cool itself while we keep moving. Unfortunately, animals aren’t so lucky, and when it comes to the hot summer, your pets require other methods to keep them cool. In a situation where we might just be sweating from the heat, your animals could be in much more discomfort than you realize. The most reliable way to keep your kitties cool is to run your AC. It might cost you more money in the long run, but it’s one of the only ways to guarantee that your home will stay nice and cool if you’re living in an area where the temperature reaches extreme levels of heat. 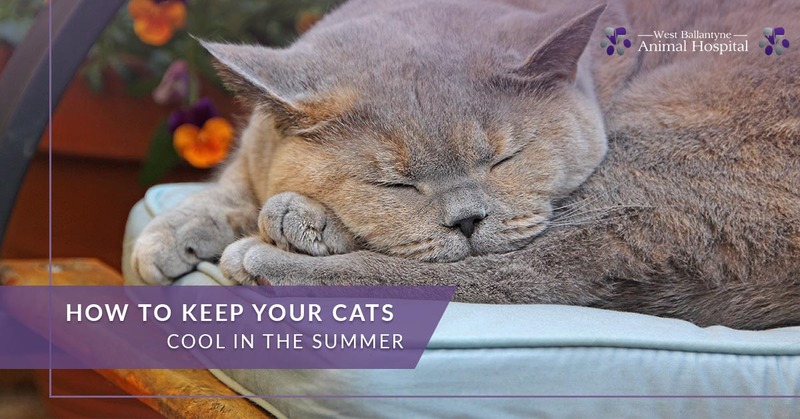 With your air conditioner going, you won’t have to worry about your home turning into a hot box, and for the cat, things will basically be business as usual. Of course, a constantly running AC isn’t viable for a lot of people. AC units can easily break down, and the cost of running it all the time could be more than you’re able to afford. In this instance, it’s nice to create some airflow in your home. A lot of cats don’t like relaxing right next to fans, due to the heavy air flow and loud noise. However, if you place fans next to open windows, it will create a nice flow of air that circulates throughout your home. This will help to make the heat more bearable, and your cat might just find somewhere that catches the breeze. As it turns out, drinking cold liquid does help to cool us down, if even just slightly, and it’s the same for cats. One thing you can do to slightly ease their burden is to put ice cubes in their water. This will make things more cold than usual, and they might keep coming back to it if they’re feeling exceptionally hot. The farther away from sunlight, the better. While many cats like to lounge in the sunlight, it’s not a good idea when they are heated up. That’s why you should make sure there is plenty of shade in your home and well-hidden nooks and crannies that your cat can find their way into, such as inside your closet or under your bed. These kinds of spaces can be much more detached from the heat and give your cat some needed rest. The last thing you need to know is that you should take your cat to your nearby veterinarian if they’re showing signs of heat stroke. This includes panting, lethargy, or collapsing. At West Ballantyne Animal Hospital, we offer emergency vet services and feline care. Are you concerned about the health of your kitty? Contact us today!